Ian Traylor. Pic: Peter Harman. Ian Traylor completed a hat-trick in 11 minutes, added his fourth almost immediately and the Martyrs led 8-0 after 37 minutes at the MetCoaches Community Stadium. Traylor (4), Owain Jones (2), Tom Meechan (2) and Connor Young scored for Merthyr, who produced a fluent, clinical team performance against a visiting team struggling at the foot of Evostik Southern League Premier football. A minutes silence was observed in memory of Lyn Jones before kick-off and it was fitting that Merthyr turned on the style. The Merthyr Town and Staines teams line up before kick-off at the MetCoaches Stadium. Traylor struck first when he first home from close range in the opening minute from Ben Swallow’s accurate pass. Sharpshooter ‘Traylz’ struck again after two minutes when he headed into the Staines net after an outstanding chipped cross from Meechan. 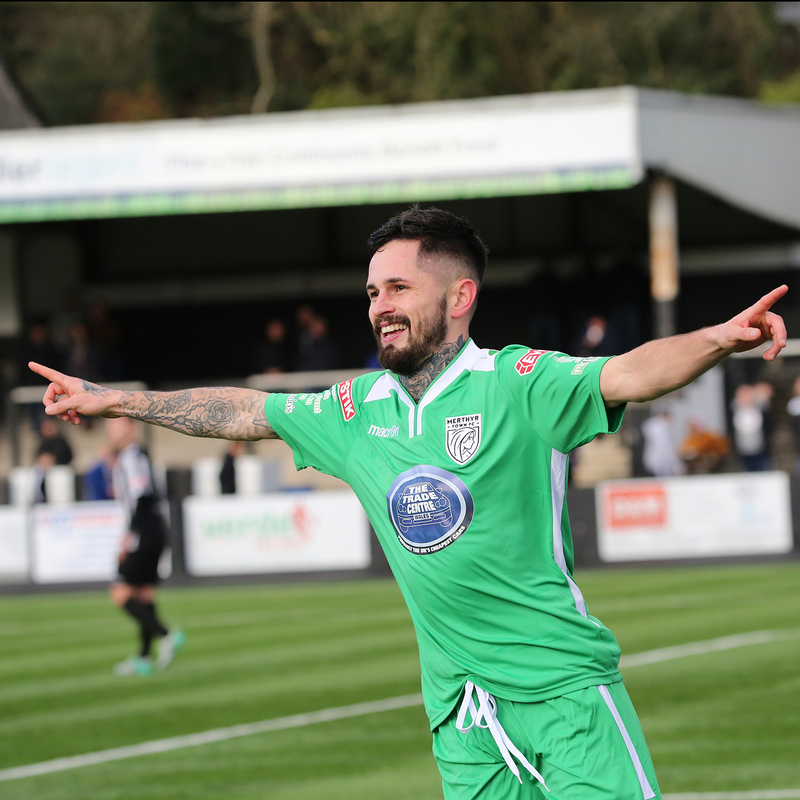 Merthyr led 3-0 when Traylor lobbed the goalkeeper in the 11th minute and then netted again when he went round the Staines man and finished with ease. Staines goalkeeper Louis Dixon made an outstanding save to deny Owain Jones, who looked certain to score with a side-footed effort. Meecham was on target when he bent a glorious effort into the far corner from just outside the box on 18 minutes and the same player struck Merthyr’s sixth on the half volley three minutes later. The scene at Merthyr Town’s MetCoaches Stadium. Jones slid a shot under the ‘keeper three minutes later and then he smashed a shot over the goalkeeper from just outside the penalty area. The ball flew in off the underside of the bar and with 37 minutes gone the Martyrs were 8-0 ahead. Player-Manager Gavin Williams sent on three substitutes during the second half with Ashley Evans making a welcome return to action after injury. Kerry Morgan and Craig Reddy were the other subs, while the outstanding Lee Lucas, Meechan and Traylor were the players to leave the action. Staines, to their credit, kept battling, but there was no way back after an horrendous start. They did go close before half-time when a shot was blocked by captain Kyle Patten. From the resulting corner Staines went for goal, but the shot flew over the bar. It was just about the only time home goalkeeper Scott Reed was threatened. Merthyr Town: Scott Reed, Ben Swallow, Jarrad Wright, Connor Young, Piero Lewis, Jamie Veale, Kyle Patten (capt), Lee Lucas (Ashley Evans), Owain Jones, Tom Meechan (Kerry Morgan), Ian Traylor (Craig Reddy). Subs: Ashley Evans, Craig Reddy, Kerry Morgan, Gavin Williams. Staines Town: Louis Dixon, Liam Newton (Mo Round 57), Mack Miskin, Harry Agombar (caps), Joe McEvoy, Ryan Handelaar (Jordan Harrison 46), Alex Yearwood, Channing Campbell-Young, Che Krabbendam, Joe Dixon, Matthew Bremford. Match v Beaconsfield Town away to be rearranged.